The rahn-based Islamic microcredit facility is currently popular among Islamic financial institutions in Malaysia, essentially because of its commercial features, which make it attractive and competitive with conventional pawnbroking. However, the substance of this product triggers some Shari'ah issues, which are mainly centred on the safekeeping fee the bank charges the customer under the principle of ijarah al-hifz (safekeeping fee) and wadi'ah yad al-damanah (guaranteed safe custody). This research is primarily intended to examine the key Shari'ah issues associated with the structure that is widely accepted at present. Other potential structures are also examined and compared with the current structure. This research undertakes a case study of two selected Islamic banks that offer a rahn-based Islamic microcredit facility to their clients. The product manual of each bank has been examined to understand the structure flow of the product, payment of the safekeeping fee and other relevant operational aspects of the product. Interviews have also been employed to gather data related to the operation of this product that was not available in the product manuals of the two selected Islamic banks. 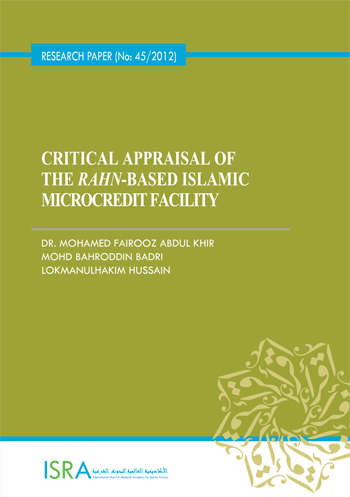 Taking into account all the Shari'ah issues relevant to the current structure, this research proposes a new structure as a viable alternative to the current structure of rahn-based Islamic microcredit facility. It is found that the proposed structure, based on sarf, can serve as an alternative to the current structure because it complies with the Shari'ah and meets most of the distinctive features of the Islamic microcredit facility.